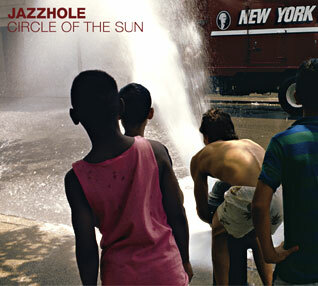 I was a little nervous when I received Jazzhole’s new release “Circle of the Sun“, because I wanted to play it at work but I was not sure if it was “office-friendly.” My first exposure to Jazzhole was their funky “The Beat is the Bomb” remix album in 1996. I was wonderfully surprised when I heard the opening track “Love Philosophy” with Marlon Saunders’ smooth vocals over a mellow backing groove. I played the entire album several times that day and have been enjoying it very much since then. Their neo soul/nu-jazz grooves are as peaceful and tranquil as they are earthy, funky, and soulful. The New York based band Jazzhole debuted in 1994 with founding members Marlon Saunders, John Pondel, and Warren Rosenstein. Their lineup of players has changed over the years as the band and their sound evolved. The trio is still responsible for much of the songwriting and production and several new members have been added to their musical landscape. Tabla (drum) player Naren Budhakar, vocalist and Cameroon-native Kaïssa Doumbé, and percussionist Daniel Sadownick have joined the rich mixture of this group. Rounding out their dynamic groove are vocalists Lucia Iman and Michelle Lewis, David Innisis on bass, Dave Binney on saxophone, Gary Pozner on rhodes and organ, Kevin Disimone on rhodes, Mark Robohm on drums, and Mazz-Mlani on violin. There is a groove for every mood on this album from bouncy rhythms to warm summer night melodies. For more information on Jazzhole and sound clips from their current release, please check out their website, www.jazzhole.com. This entry was posted on Tuesday, April 8th, 2003 at 6:52 pm. It is filed under Music Reviews and tagged with Circle of the Sun, funk, Jazzhole, soul. You can follow any responses to this entry through the RSS 2.0 feed. It’s reviews like this one that make me wanna drop everything I’m doing to pick up this album — Thanks! I’m glad that I’m not the only one with the impulse to drop everything and run out and buy great music. I think the only thing stopping me right now is that the store that I would purchase this at, is not open yet. That’s why I almost don’t want to read these reviews…I can never afford all the wealth of good music out there that I want. That’s a great photo on the album cover. YEAH! Jazzhole…. The Beat is the Bomb! Also, Marlon Saunders of Jazzhole just released a solo project, called Enter My Mind…It’s much more rooted in soul, but critics are already saying it’s one of the best cds out this year…i’d have to agree..listen at http://www.marlonsaunders.com. peace.